Specifications: 12" blades. Sizes: 2'8" cut with 5 blades left & right, 3'2" cut with 6 blades left & right, and 3'8" cut with seven blades left & right. Features: The ideal berm cultivator for orchards and vineyards. 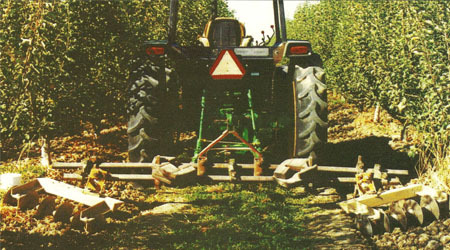 Mounted on a toolbar, minimum tillage with weed control is maintained with these small disc gangs. Individual gang angle and tilt are quickly accomplished with the multi-adjustment mounting heads. Units can be spaced any distance apart to till only the sides of the berms while leaving the center areas untilled. It can alternately move soil towards or away from the berm by changing gangs side to side. Ideal for non-till of the center area for improved habitat of beneficial insects.